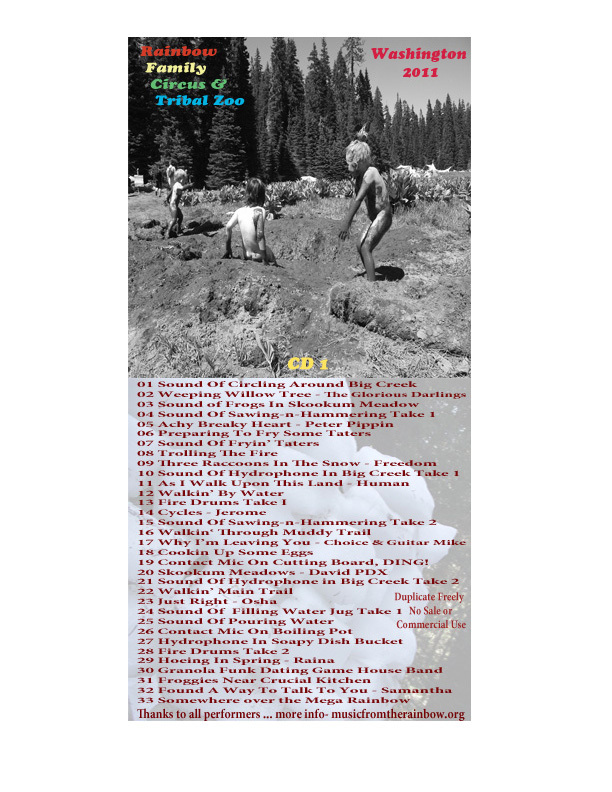 The 2011 Washington rainbow gathering was held in the Gifford Pinochet National Forest. 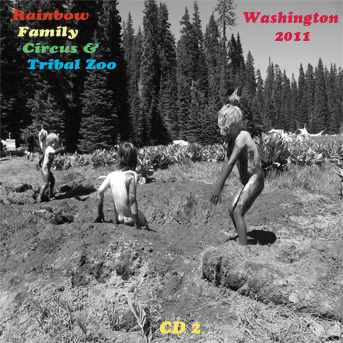 This years collection of field recordings includes 66 songs, poems and outtakes recorded at the 2011 Washington rainbow gathering held in the Gifford Pinochet National Forest near the towns of Carson and Cougar. Most of the songs and poems were recorded in the Granola Funk, Popcorner, Poly-Glamorous & What Have You neighborhood. After sorting through the audio I came up with a 2 CD set with 33 tracks on each disc. As always, Pass Freely, No Sale or Commercial Use. It should be noted that many of the tracks on this years collection features the ambient sounds of food prep, theater construction, trail walking wanders, underwater hydrophone recordings (Aquarian Audio H1a Hydrophone), dish buckets, contact mic on cutting board and heartbeats, campfire ruminations and, of course, the frogs in and around Skookum Meadows. It has been an interest of mine for some time to include more of the often forgotten sounds of our daily chores, comings and goings, and what have you. Recording at a gathering offers serendipitous and effervescent sound bites at almost any given moment and I was fortunate enough to discover some charming and bucolic snippets from the various camps, kitchens, trails, forests and meadows. From the vapors of our imagination to tomorrows memories, may this collection of mellifluous songs, poems and outtakes delightfully entertain your ears like the way a homemade vanilla milkshake engages joy upon your taste buds. DING! DING! DING! Thank you so much for the music couldn’t make it home this year,but listening to this makes me feel like I’m home…=-)Lovin you!!! Awesome, can’t wait to get my taste! Thanks for all you do to get this out there. 3) Put in my random radio playlist on RainbowGlowMedicine.com? 4) I can if you like also include them in the listings. thanks for showing this world love. I’m new to the Rainbow family, meditation, drum circles, one love, loving my earthly mother, etc. I have been listening to these recordings and visualizing myself being there with you all. It’s so peaceful and happy. I want to attend the next one as it will be in my area (Kentucky) Peace be with you all. What you are hearing is the “raw tapping”. There are probably a dozen recordings from the July 5th Open Mic night at Popcorner/What Have You. I would love to offer more material but it does take an insurmountable amount of time and work to produce 2 hours of recordings after sorting through over 14 hours of material. My goal is to offer a well produced and unique collection of songs, stories and poems regardless of personal tastes. I have no interest in merely taking every recording and sloppily putting together an unedited, incomplete, and scattered compilation. Wow. How sad. I was not aware he passed away. I’ve very sorry to be the messenger of ths sad news… Guitar Mikal’s music will live on by Rainbow campfires as long as there are Rainbow campfires! He is Home now… I can’t wait to see him again!